Smith got the idea for FedEx while still an undergraduate at Yale. In a 1965 economic term paper, he correctly observed that as society became more automated, companies like IBM and Xerox would need a faster, more dependable delivery system. Acting on observations he'd made in a college economics paper, Smith built a unique hub-and-spoke delivery network to keep pace with the developing computer industry. In 1973, Smith launched Federal Express with his own money and established the company as the delivery service of choice for modern businesses. 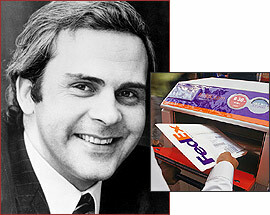 Frederick W. Smith, the founder of FedEx, was born in 1944 in Marks, Mississippi. While an undergraduate at Yale University in 1965, Smith wrote an economics paper observing that as society became more automated, computer companies would need to insure that their products were dependable. Computers couldn't make business cheaper, faster, and more accurate unless they could be fixed rapidly. Their manufacturers would need a nimble logistics and delivery system to keep their customers happy. After a tour of duty with the Marines in Vietnam, Smith returned home in 1971 to find that his predictions had come true. Computers were becoming an indispensable part of doing business and delivery systems were not keeping up. He realized that a hub-and-spoke network could create an enormous number of connections more efficiently than a point-to-point delivery system. The delivery system he conceived used both airplanes and trucks, which was unheard of at the time. To succeed, Smith knew he couldn't afford to start small; he would have to build the entire delivery network. At age 29, Smith launched Federal Express with his own money. He first tested the initial 25-city network, flying empty boxes across the country, and then went live on April 17, 1973. To keep the network of cities growing, he raised $90 million in venture capital from investors like Allstate and Newport Securities. The company endured twenty-six months running at a loss before it broke even. Over the next couple of decades, Smith committed to ensuring detailed transport information such as estimated arrival times and prompt deliveries. To stay competitive with the United Parcel Service (UPS), Federal Express purchased the trucking company RPS and enjoyed a resulting boost in profits. By the turn of the century, the company, now named FedEx, had an estimated worth of $16 billion with 584 planes and 38,500 trucks. Smith had established FedEx as the delivery service of choice for modern businesses.